Back in 1989, a little toy company no one had ever heard of called "ToyBiz" landed the license for Tim Burton's Batman, that summer's major blockbuster. Shockingly, while they made lots of vehicles and playsets, they only released three actual action figures. No variations, no multipacks, nothing but three figures. Batman, Joker, and a henchman: Bob the Goon. The end. ToyBiz had the distinction of being the only company ever to release a henchman figure with a movie line - until now. In order to court the collector market this time around, Mattel has created two separate (but not equal) toy lines for The Dark Knight. There's the usual 5" line, with its simple sculpts and silly non-movie costumes, but there's also the Movie Masters line, which offers detailed 6" figures with the level of sculpting and articulation modern fans demand. The line features a surprisingly familiar assortment: Batman, Joker, and a henchman. Hmm. The goon is more properly known as the "Gotham City Thug," and he's part of Joker's clown-mask-wearing entourage. Some guy hired to pull a bank job, brought on because of his specific skills, the Thug was probably looking forward to a big tax-free payday. Of course, the Joker being the Joker, the odds of this guy living to enjoy that haul aren't very good. As soon as he's outlived his usefulness, he's done. Joker knows he's main attraction, so he dresses his gang simply, in all-black outfits that won't draw attention away from the star. In fact, the brown shoes are the only break from the norm. The thug is decked out in black pants, shirt and jacket, and he's even wearing black driving gloves. There are two spots of silver on him: his belt buckle, and the clasp on his bolo tie. It's a classic look, which makes his head seem all the stranger. To keep their anonymity, Joker's henchmen wear stylized clown masks. There are a whole bunch of them seen in the film, but there's only one version available in toy form. The mask has a big nose, cheekbones and a super-wide grin. The mouth and tip of the nose are red, and there are blue circles around his eyes. The black dots painted on the top of his head show that the mask had rooted hair at some point - there are still a few blue and green tufts remaining. There seems to be a bandaid on his head, for some reason, and you can see brown hair poking out at the back of the mask. The thug's articulation is very good - better than the Joker's, even. He's got a balljointed head, balljointed shoulders, swivel biceps, hinge elbows, swivel wrists, a hinged torso, swivel waist, post-hinge hips, swivel thighs, hinged knees and hinged ankles. That's plenty of movement, and the torso joint was particularly surprising. Thanks to the tuft on his head, the Gotham City Thug just tops 6⅛" tall, so he looks nice with your DC and Marvel figures, and is perfectly sized for the other Movie Masters. Thug Boy (the figure, not Adam Warren's Empowered character) doesn't have any accessories, though his hands are molded to hold... something. He looks nice with pistols, but you'll have to raid another figure to give them to him. You do get the standard "crime scene evidence" combo of a ziplock bag and some waste of plastic. 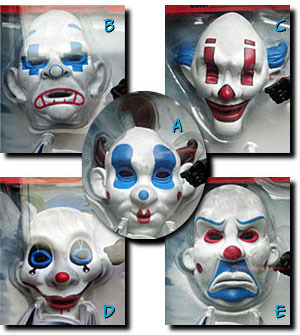 In this case, the waste of plastic is a clown mask - specifically, one of five clown masks. Yes, following the same wonderfully annoying business plan that got us three Batmen and nine Catwomen, there are five randomly packed clown masks, each with unique molds. It's not just one mask painted five different ways, and one of them actually matches the one the figure's wearing: guess that's Mattel's way of throwing us a bone. All five masks are movie-accurate, which is nice. Oh, and just a heads-up? Once people start seeing the movie, expect the "frowny" face ("E," in our collage up there) to be the most in-demand. Shop wisely. 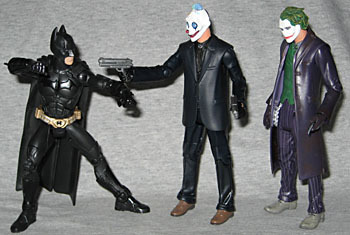 The Gotham City Thug is a well-made figure with nice poseability. He'd be better with some (useful) accessories instead of the evidence bag, but this is still a very good buy, and an excellent addition to your 6" DC ranks - after all, it took nearly 20 years from Bob the Goon to Cotham City Thug, so who knows when we'll ever see another henchman on the pegs?